Did you know that it is estimated that about half of all the cookies baked in the U.S. are chocolate chip cookies? The irresistible treats have been a huge favorite since chocolate crunch cookies were created by Ruth Wakefield in the 1930s. They've been delighting children and adults and finding their way into lunchboxes for generations. Chocolate chip cookies are always a hit! This recipe is a classic formula made with the optional addition of chopped walnuts or pecans. The recipe makes a big batch of about 5 to 6 dozen chocolate chip cookies. Make extra and freeze them! Heat the oven to 375 F (190 C/Gas 5). Lightly grease baking sheets or line them with parchment paper or silicone baking mats. In a bowl, combine the flour, baking soda, and salt; stir to blend the dry ingredients thoroughly. In a mixing bowl with an electric mixer on medium-high speed, beat the granulated and brown sugars with the butter until light and fluffy. Add the dry ingredients into the butter and sugar mixture and beat on medium speed just until blended. Add the chocolate chips and chopped walnuts or pecans, if using. Fold until well incorporated. 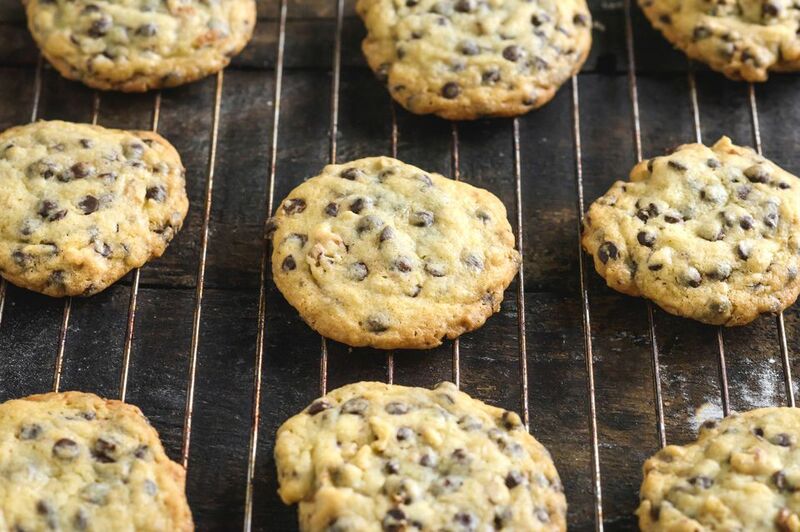 Drop the cookie dough onto the prepared baking sheets by tablespoonfuls, leaving about 2 inches between cookies. Bake the cookies in the preheated oven for 10 to 12 minutes, or until they are set and lightly browned. Remove the chocolate chip cookies to a rack to cool. To make-ahead, mix the cookie dough up a day in advance, cover the bowl, and refrigerate it for an hour, overnight, or up to 24 hours. The long chilling time enhances the flavor and texture of the cookies, and they won't spread as much in the oven. For a crispy exterior and tender center, bake the cookies at 425 F for about 8 to 10 minutes. For extra crispy chocolate chip cookies, bake them at 300 F for about 25 minutes. Vary the flavors by adding different types of morsels or chips. Try them with milk chocolate chips, a combination of peanut butter or butterscotch and chocolate chips, or add some toffee or brickle chips for extra crunch. For a darker and more tender, cake-like cookie, replace the granulated and light brown sugars with 1 1/2 cups of dark brown sugar. Adding corn syrup to the cookies produces a chewier center. Omit the granulated sugar and use 1 cup of brown sugar and 1/4 cup of corn syrup (light or dark).